Here's a few pictures of my spring decorations. In the two bunny picture the bunny on the left is a cheap one probably from Joannes. 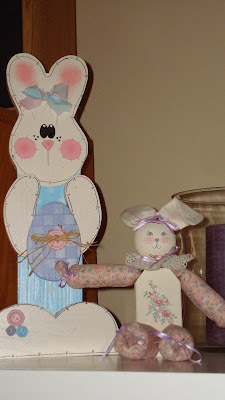 But the little bunny on the right I made in a class years ago. I'm sure the instructor painted the face cause I know I am no painter! Now this group of three bunnies are my favorites. The little plaid bunny is one of several I made for my kids quite a while ago. This one was Kevin's. I'm not sure where Jenny's is since the move. The little one to the right was given to me by our good friend, Barb. 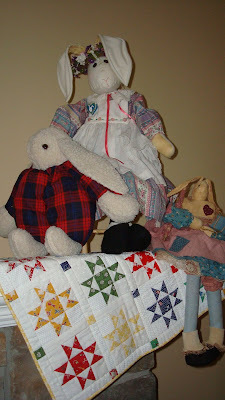 Now the taller bunny was made by Sandy, a friend in Faithful Circle Quilters. 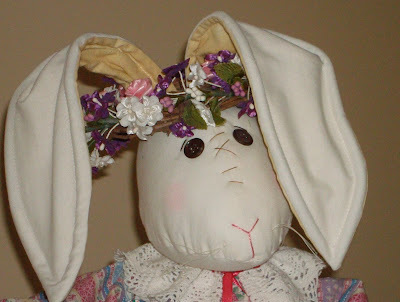 For several years, she would make a bunny for each of the auctions we sponsored. And, I would bid. It took me several times to win the bid because these bunnies were very popular. I am sorry that I haven't found her basket of carrots. The little quilt they are sitting on I won from a raffle. It came with an American Girl doll, clothes, several quilts and a little chair. The doll isn't out but I ran across the quilt when I unpacked something! The bunny is sitting on a chair. Here's a close up of her face. Isn't she sweet? I have a ufo I've started working on -- two stuffed bunnies. I'll share a picture of them if I finish anytime soon. e 4 muffies. I use the convection oven at 375 for 14 minutes. 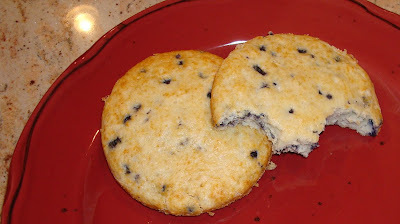 (And of course, the muffin top pan.) And yummy muffies are the results! Your bunnies are cute, but I really like your star quilt.